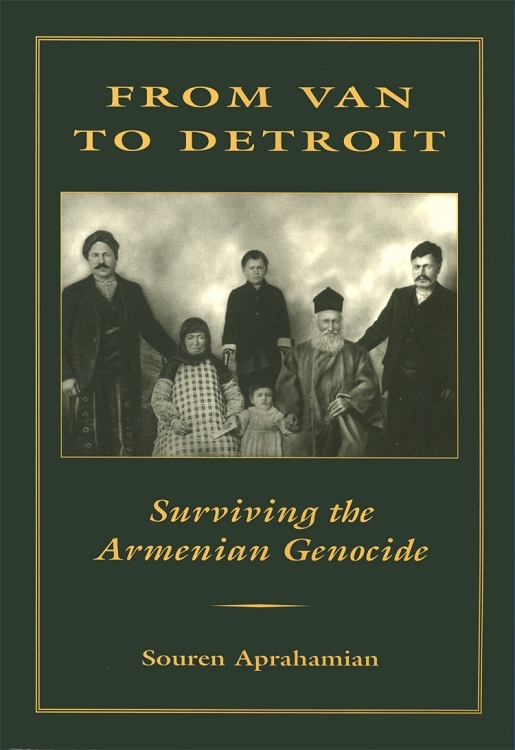 From Van to Detroit: Surviving the Armenian Genocide is the autobiography of Souren Aprahamian. His story begins in the eastern Anatolian city of Van where he witnessed the controversial Armenian defense of Van. His family ultimately found refuge in a small town near Baghdad where they attempted to rebuild their lives. The family soon emigrated to America where they were welcomed by the Armenian community of Detroit. The book is a story of survival, but it also gives insight into the particularities of village life in Van before 1915 and the struggles of Armenian immigrants in the United States in the 1920s and 1930s. Aprahamian ultimately perseveres and establishes himself in a successful career as a grocer after pursuing degrees in chemical and mechanical engineering. Despite the terror that Aprahamian lived through, there is no malice in his story. The book was written out of the need to preserve the truth and the history of a people that is fading into the past.